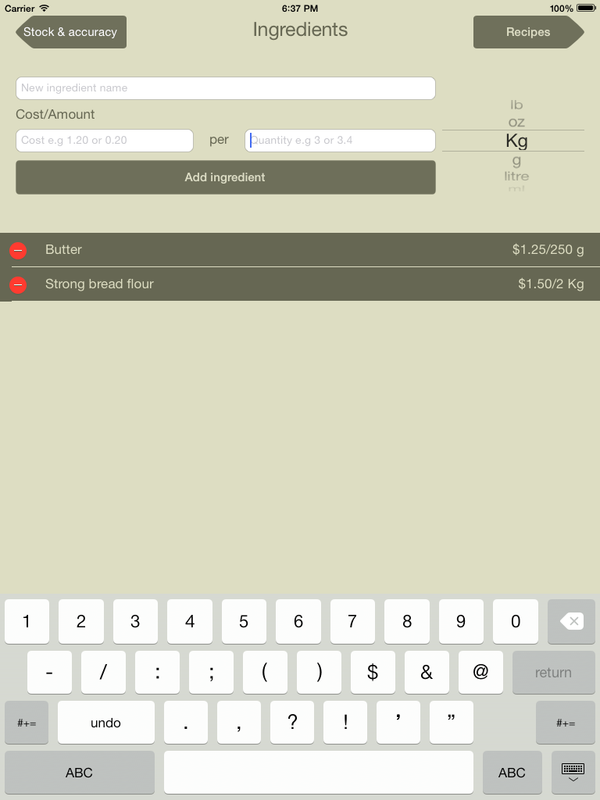 The Recipe Costing Calculator app is designed to help you to calculate the costs of your recipes. 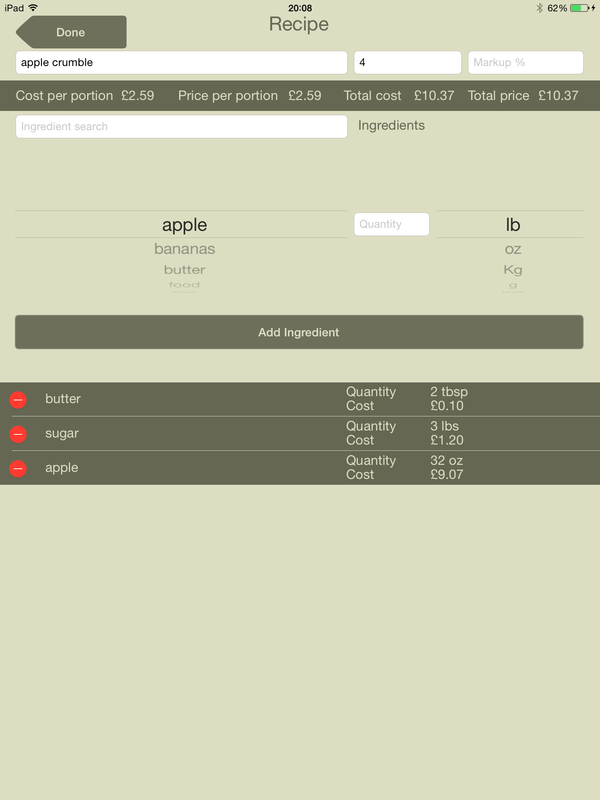 The central screen of the app is your recipe list. Here you see a list of the recipes that you have costed, along with the total cost and cost per portion. However, you don’t start here, as with all cooking you start with the ingredients screen, so by pressing the ingredients button at the top, or by swiping from left to right you will arrive at the Ingredients page. This page allows you to put in the ingredients that you use in your recipes. If an ingredient is used in more than one recipe then you only need to enter it once. You enter the name of the ingredient, as well as the price that you pay for the amount that you pay. e.g. $3.20 for 1.5 Kg of flour. If you want to change the amount because the price has changed (probably not downwards) then just click on the ingredient and you can change it. After you have entered your ingredients you can go back to the Recipes page and hit the “New Recipe” button. On the new recipe page you enter the name of the recipe that you are making, how many people it serves, and then add the ingredients, along with the quantities. These again can be changed by selecting them from the list below. 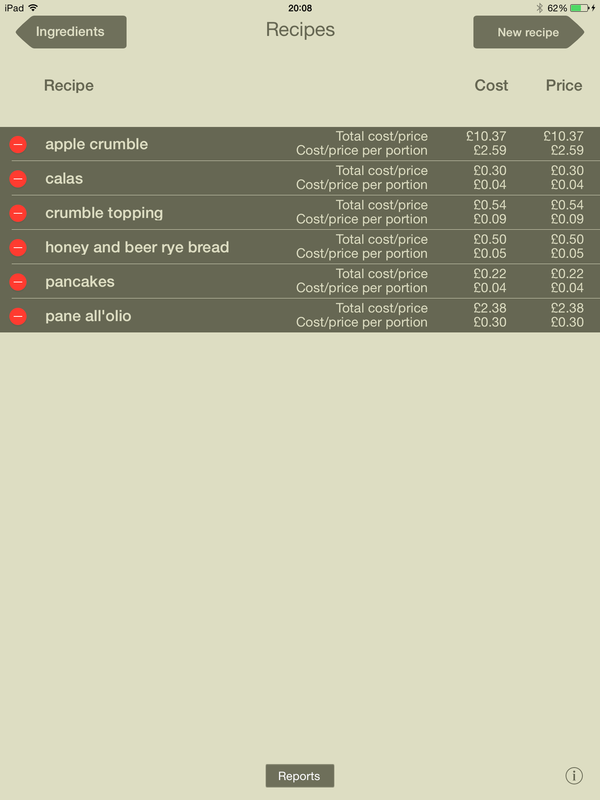 As you add them you will see the cost of each ingredient, as well as the total cost and cost per portion. 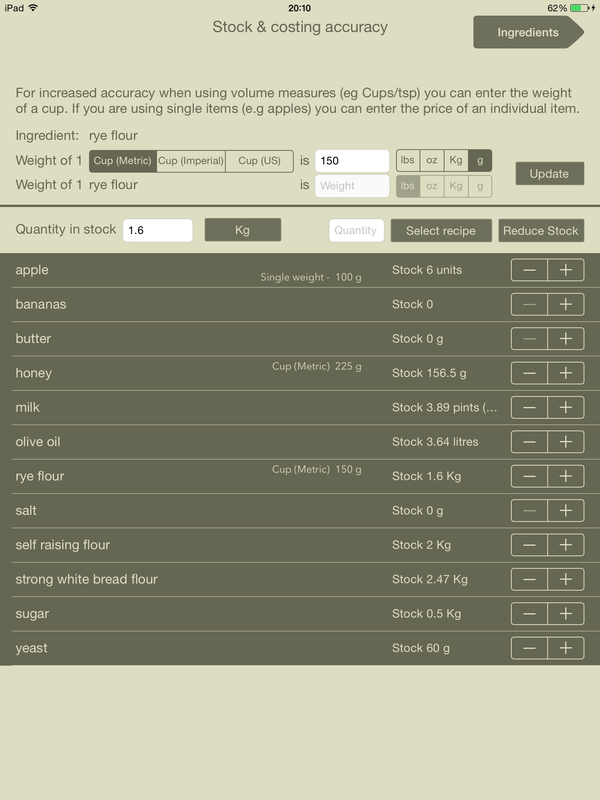 In the first version of the app there was a difficulty when mixing ingredients that are bought by weight, but measured by volume (eg when using Cups for measures) This is because each ingredient has a different weight for a cup. I had therefore estimated the cups weight for solid ingredients at 125g for a Metric Cup, 142g for an Imperial Cup and 118g for a US Cup. It is now possible to override these defaults on the stock and accuracy page. The stock and accuracy page also allows you to keep track of the different stock levels of your ingredients. The method screen allows you to enter the method, or instructions of the recipe, and also to take photos of the recipe, or the finished product. Images can be loaded from the photo library, or taken using the camera by pressing the take photo button, and selected from the list at the bottom of the screen. The method area or the photo area can be enlarged by double tapping on it. Any method or photos that you have here will be printed out if you choose to print the recipe. You now have an option to enable security on the app. Enabling this will cause the app to prompt you to enter a password whenever you start the app. Export data allows you to export the different sets of data in the app so that you can use it elsewhere. It is exported in a CSV format that can be imported into a spreadsheet. Create Receipt will allow you to select items that are being purchased, enter tax and discounts that are applicable and print off a receipt for your customers. Print Recipe will allow you to print off your recipes, along with any photos that you have taken of them.